BULGIN'S latest addition to their range of IP68 waterproof connectors is a new design for USB connections, available from Braemac . Based around the standard USB interface, these 4 pole hot pluggable connectors have USB Ver 2 performance offering high speed data transfer up to 480Mbs. Robustly housed in an over-moulded body using UL94V-0 rated PVC, the connectors are environmentally sealed to IP68. Shielded USB connectors, combined with continuous screening, produce a high degree of noise immunity and EMI protection. This is an important consideration in electrically noisy industrial environments. Three formats of single and double ended cables offer a number of options for environmentally sealed connections between PC and peripherals. These include IP68 sealed A type USB to standard B type USB, IP68 sealed B type USB to standard A type USB and IP68 sealed A type USB to IP68 sealed B type USB. Each is available in 2m, 3m and 5m lengths. The cable connector is based on Bulgin's Standard Buccaneer design but now features over moulding technology where the connector body is moulded directly over the cable. This gives both a tough outer body and reliable cable seal. The screw coupling provides a secure and proven locking system allowing quick and easy connections. The mating panel mount connectors have either A or B type USB IP68 connection to the front of panel and a standard USB connection to the rear. Shielded USB adaptors are used to maintain screening throughout the system and adaptor leads are available to provide a direct connection to PCB's via a 0.1" pitch headers. This design also maintains complete compatibility with standard USB connectors, a useful feature to allow standard USB cables or USB memory sticks to be utilised. 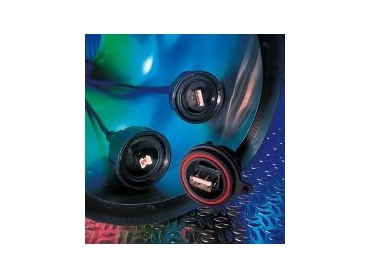 Sealing caps are also available to maintain the IP rating of unmated connectors. Standard USB connectors are too delicate to withstand the rigorous demands of industrial environments, so Bulgin's USB Buccaneer connectors will find many applications within industrial control, where water and dust may be present, and a strong, robust and secure USB connector is needed for connection between computers and peripherals. USB Buccaneer is an extension to Bulgin's Buccaneer family of waterproof connectors, which includes Ethernet connectors and patch cords along with four ranges of multipole power connectors.